Welcome to Fotopod! Testimonials - Welcome to Fotopod! Testimonials - Welcome to Fotopod! Thank you Fotopod booth for going out of your way to make us custom photo strip templates. You incorporated our wedding theme colors perfectly and captured a memorial night! ***** stars! manage your photo booth business. We use it for all our event bookings! Click the logo for a free trial! 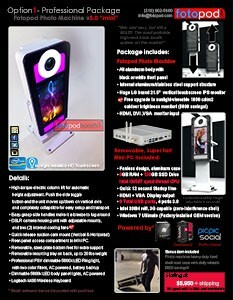 “Thanks Fotopod Booth!” I have to tell you this booth is going to be a game changer for our business. We’ve had it two weeks, we’ve already booked six events for it and almost have it halfway paid for already. We are booking events at $100 an hour MORE than with our other booths! LOVE IT!! “After working 3 years in a growing and very competitive photo booth business I wanted to find something new and exciting to offer our customers. I started my search looking for something one of a kind that would WOW any event and that’s just what I found with the Fotopod Booth. Before I purchased the Fotopod Booth I had so many questions to ensure this was the right booth for our business and Tu was so helpful every step of the way. Our new booth arrived quickly, after unboxing I had lots of questions and Tu was just a call, text or email away to answer them all. His response time is truly incredible! Tu has become a great resource to us in all things photo booth, always willing to share his knowledge and experiences, even now months after buying our Fotopod Booth. The quality of the Fotopod Booth machine and inflatable cube are top notch. The lighting is incredible, the bright LED’s blow our customers away. 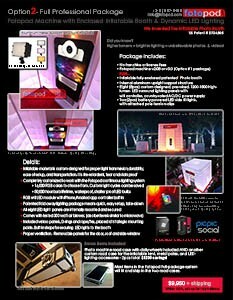 Best part is how you can customize the lighting and effects, it’s not just lighting in your photo booth, it’s a light show! 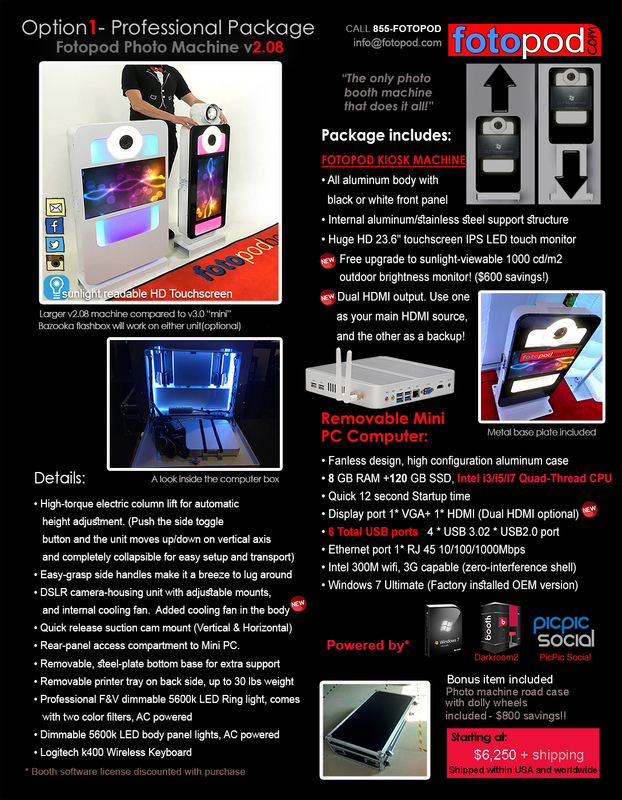 The Fotopod Booth quickly became our best performer, in just six months we have doubled our bookings all thanks to this great addition to our business. 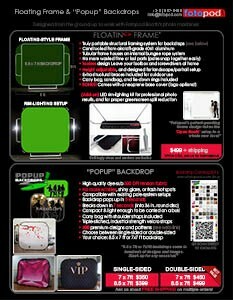 If your looking for something truly unique with outstanding quality and great service the Fotopod Booth is a winner in every way! 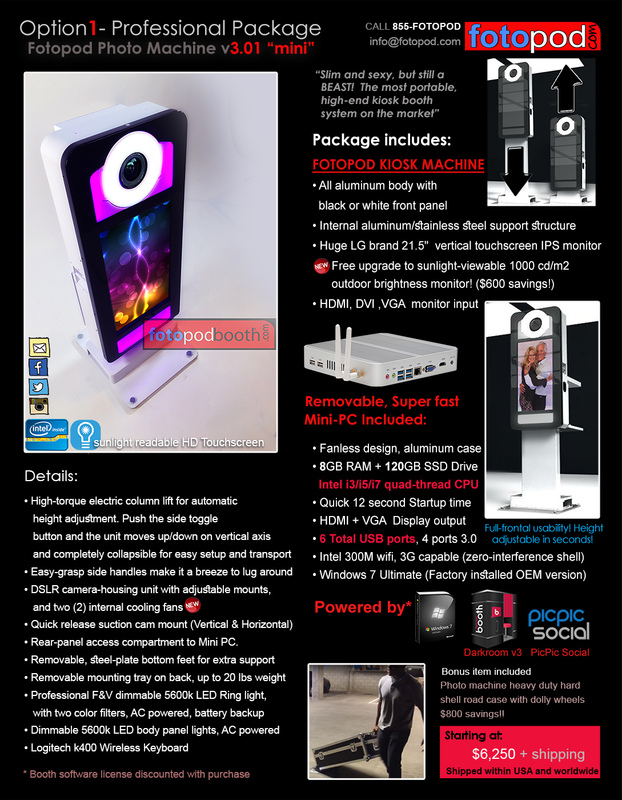 “When I discovered Fotopod Booth searching for my new Photo Booth system, I was at first blown away by the design of the machine. It was the first Photo Booth that looked really beautiful to me, and I was really looking for that : I didn’t want a flight case with a hole and a touch screen! The second thing that blown me away was the quality of the lighting. I had seen many others photo booth companies pictures and it was the first time that I found an excellent lighting system that was soft and made people look really beautiful. As a professional photographer, I am extremely sensitive to light quality and I couldn’t imagine having bad lighting with my photo booth machine! Fotopod Booth was also mastering lighting techniques! So I gave a look further to the website and I discovered that the talented designer was also a Photo Booth event company owner! It is something really unique in the Photo Booth industry today, and I can say now that it is also a force. What best innovations possibilities than a Photo Booth designer in direct contact with Photo Booth customer’s expectations? I was really excited and I decided to contact Tu (the owner). We talked a long time with Skype (I’m in France and he is in US) and I decided to buy one of his Photo Booth. A few weeks later, my Photo Booth arrived, I was so happy! It was really a very good Photo Booth system with high quality materials. You know that you can trust your Photo Booth machine and that it will always be here for you! 2 months later, I bought the inflatable tent system, not one of the copy you can find in China, the original one with excellent led lighting system with Iphone Wi-Fi controller. When used with the awesome designed Photo Booth, the “whoa” factor is always present for the customers! 6 months later, I invested again and I bought a mini Photo Booth system. Now I would like to talk a little bit about Tu. To be totally honest, I was a little bit doubtfully, could I trust one person that runs at the same time a photo booth rental company and a Photo Booth production company? His website, made also by himself was not looking like all the others Photo Booths companies. Now I understand why : It’s because Tu is not like anybody else. He’s a unique genius photo booth designer always listening to both his photo booth events customers and his photo booth products buyers. When I contact him, he nevers sleeps (we have 9 hours jetlag). He is always designing a new Photobooth, creating new accessories, inventing new lighting schems or reinventing backdrop stand. He’s awesome! I really love that. He’s so passionate about what he does, he is for me the leader of this industry! Trust me, you can trust Tu! “Clients and guests love my FotoPod! Its sleek, modern and the hydraulic lift makes it easy to transport! I made my initial investment back in 5 weeks! and the final results speak for itself. I think the tent that you created is just amazing. You are staring at website after website, looking at features and thinking this is the best photo booth. You are thinking about different features and colors, and pricing. But, what you may be missing is the bigger picture. Once you purchase your photo booth, you are going to have questions; and not just a handful. You are going to have a ton of questions. I consider myself tech savvy, but never would have guessed I would have had as many questions as I did. I think the one thing that people don’t place a value on is customer service. We say we place a value on it, but do you really? Let’s be honest. 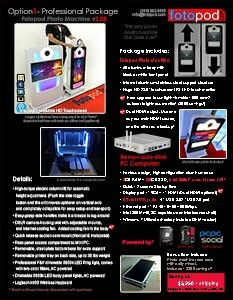 All photo booths, take pictures, can use a green screen and for better or worse are about the same price. Sure there are some some really expensive booths and some really inexpensive ones, but really, they are all about the same price. The one thing I saw right before we made our choice was Tu. Tu is not a business owner but really a person that cares. He is in the business of event planning, and has learned a ton from being in your shoes, conducting events. We were deciding between two photo booths. Again, they were about the same price. The night we decided to go forward with Tu, I read a review that said something to the fact of his communication and the ease in which it was to get a hold of him. Working with Tu is like working with a friend. He has answered texts, emails and phone calls. He has interrupted business plans and vacations for the sake of helping us to get off the ground. I believe that customer service is everything. You may be able to purchase an alternate photo booth, but what you are missing out on is simply put, Tu. He is a kind-hearted person that takes the time to listen to your questions, answers them clearly and helps you to maximize your impact at your events. I can’t say it enough Tu is the difference in your decision. Let me make it easy for you. Choose fotopod for the amazing Photo Booth, the quality of the experience, the amazing features and most importantly, for Tu. You will have questions, whether you think you will or not. This is a true pioneer in the field, who is making it possible for people to create memories. My company thanks Tu and his team for exceeding our expectations EVERY TIME we reached out to him. Tu is approachable, reasonable, thoughtful, and a person you can rely on. If you are looking for a partner to help you maximize your potential, then look no further. I wish we knew about fotopod sooner. If you are like me, stop looking elsewhere. Stop comparing models. Start your business with the best in the business. Thank you Tu. We love your products and appreciate all your time and efforts. “I hired Fotopod Booth for a recent client’s Grand Opening after stumbling on their amazing website and phenomenal new photobooth technology. I was in awe of their concept and design, and knew that delivering their product to my client would provide an experience that would be unique and not soon forgotten. Tu and his crew did exactly that. They arrived early, set up quickly, were courteous and knowledgable. The booth provided excitement, energy, and sparked interest with every interaction and photo. We hired Fotopod Booth for our wedding on February 22, 2014 in Temecula. It was the best photobooth we could have asked for and had so many compliments about it from our wedding guests! -The one-of-a-kind pod lights up and plays music that we requested – like an art piece or something you would see at an art or music festival! -The booth fits 10+ people. 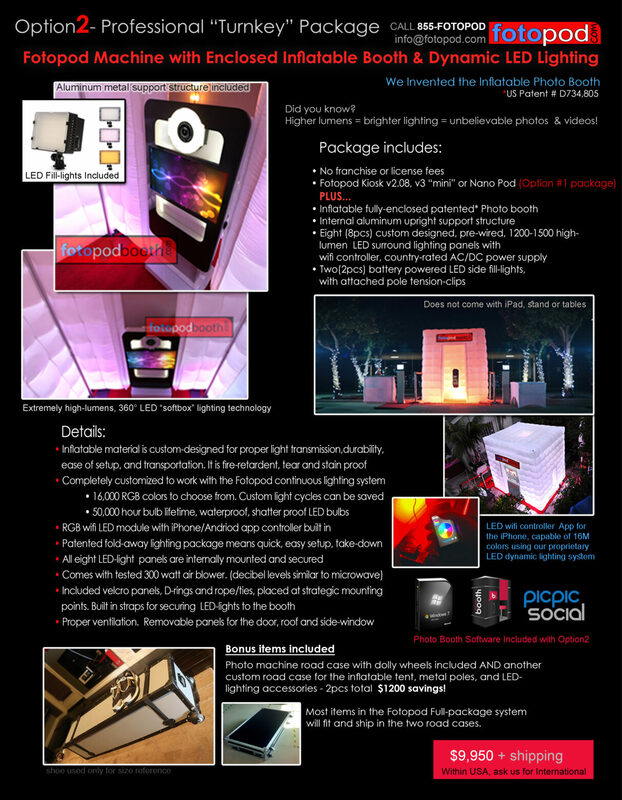 -Outside the booth, there is a live video stream showing what is going on in the booth, projected on a screen. It was hilarious! -Very large variety and unique selection of props, way more that I’ve ever seen with other booths. -Prompt picture printing (comes out a few seconds after photo was taken), and we were also provided with all high-quality pictures in a Facebook album and on a flash drive. We originally already hired another photo booth company to do our wedding, but decided to go with Fotopod Booth instead once we found out about them. We lost our original deposit with the other company but think it was well worth it. The customer service received from Tu and his team was exceptional. After our event he posted the pictures in the Facebook album right away and delivered a flash drive with all the high-res pictures to us. Tu and team take a lot of pride in their business and it shows in the quality of everything they did. Thank you very much! I’ve been meaning to post a review since I hired them but just haven’t had the time. What can I say, this photobooth is absolutely amazing. I hired them for my wedding on July 10, 2015 and I was blown away! My work has hired Fotopod every year for our holiday party and I told myself I wanted them to do my wedding. I’m glad I did because nothing compares to their design! Very creative and easy to use! All of our guests complimented the booth and that they had never seen anything like it. Excellent service and very professional! Fotopod Booth is great! I highly recommend them!